A few years ago I discovered zombie novels and how fun they are. Zombies are traditionally easy to kill, which makes them more of a background on which to play with social commentary than any other monster, and unless you think deeply about it they’re a guilt-free romp in a world turned Free Supermarket. Most zombie novels and movies concentrate almost entirely on the beginning part of the zombie apocalypse, especially the running and screaming and biting and shooting zombies in the head part. Whatever social commentary the author wants to impart is jammed into a small space of time amidst the carnage. World War Z is one of my favorite zombie novels, mostly because it’s international in scope, spends more time dealing with the cultural and political shifts in the world rather than merely the run and gun portion of the zombie apocalypse, and I liked the Studs Terkel approach. There are some problems with it, like a sameness of voice in the survivors’ stories, and a small number of women characters. I had heard some dire things about the film version, but thought perhaps knowing beforehand that the movie was different from the book I could watch it on its own merits. I was right, I could do that. And I can tell you this film reeks. It’s a hackneyed Hollywood send up of a currently popular monster. There is almost nothing left of the book. It takes the title, the POV is of a United Nations bureaucrat, and the story is told on an international level. That’s not enough to make a good film from the book. Yes, the production levels are high, and it stars a Hollywood A-lister, and yes I appreciate the legitimacy this gives to my favorite low rent monster. It’s also completely gore-less so anyone can watch it. The mysterious, nameless chronicler of the book is now Gerry, with a family, who has quit his mysterious U.N. job to become Mr. Mom. The whole film is about him saving the world so he can get back to the much more important Being Mr. Mom. It’s all twitchy, sprinting zombies with a nice warning scream so you know they’re coming. They swarm like bugs and go down easily when you shoot them. These people do not get why zombies work. There are a lot of explosions, and running and screaming, and gunfire and all the crap Hollywood thinks we need, but precious little tension and fright that is the hallmark of a good zombie flick. Gore ramps the levels of fright and tension, and being a gore-less movie may make it more accessible but it also makes it impossible to create a truly frightening and tense film. Shifting the focus from the survivor stories to Just Another Pretty Hero is nearly as bad as the loss of tension. The best parts of it, I thought, were exploring (a little) the sudden shift in socially correct bonding between people from very different backgrounds, and showing that it IS possible to have a relationship between a man and woman in a movie without it having to go all sexual. That asexual sub story really begins in the passenger plane, when Mr. Mom is tending the bloody stump that had been the hand of an Israeli soldier until he lopped it off to prevent her being infected (thus borrowing a hackneyed zombie fiction idea). She’s squirming and moaning in pain and he looks her in the eye and says without a hint of smirk, “Gut up.” Now, he could have said “Man up” or “Nut up”, which would give the moment the old Hollywood wink and a nod meaning, “We see your shaved head and shooting guns and pretending to be tough, but everyone knows you’re just a girl and girls aren’t tough enough to be real soldiers.” I really liked that they didn’t do that, instead treating the character as a soldier, not a woman soldier, if you catch my drift. I really don’t understand this one – I’m all for making changes from book to screen, but in this case, they basically kept the title and nothing else. There’s so much material in the book to work with and they somehow turned out this generic, lifeless mess. A real shame. Having read the book, I realize that there was so much potential just not even explored. It’s still a fun movie, but the promise is totally there. Good review. CFR for Mildred: Hi Carl and CMrok93: You are both indeed correct! 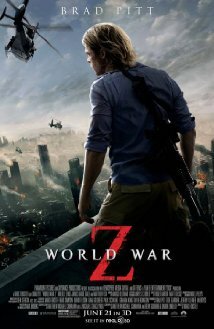 This movie stole the title of a great book and well, gave us an action adventure zombie story instead. Personally I think the real World War Z should be a mini-series as that would give everyone time to enjoy the richness of the story. Thanks for your reviews! I’ll let you know what Mildred says.